Film and sheet extrusion machinery supplier Macro Engineering & Technology (Canada) has introduced a new high-output polystyrene (PS) foam sheet extrusion line with outputs up to 700 kg/hour. The key feature of this line is a newly designed cooling screw that is said to guarantee both efficient cooling of the melt and highly uniform melt temperature distribution in the secondary extruder. This not only allows extrusion to occur at elevated outputs but also creates advantageous properties within the foam structure, such as an increased proportion of closed-cells, improving the overall strength of the foamed sheet. The system uses tandem extruders to produce foamed PS sheet between 1.2 and 5.0 mm thick, and up to 1,270 mm wide. 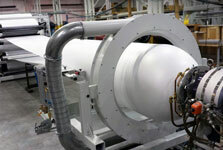 It is completed with two turret winders that wind rolls up to 2 m in diameter; however, Macro also provides the option of slitting the tube once to create one large sheet that can be wound on a single winder, simplifying the start up and roll transfer processes and reducing operator requirements on these processes. Macro says it has recently installed one of these lines to an unnamed sheet producer in South America.